Read about features of the Hospital Ship Maunganui and the Netherlands Military Hospital Ship Oranje. The Maunganui was an oil burner 30 years old with a speed of 15 to 16 knots. Her gross register was 7527 tons, her displacement 11,340 tons, her length 430 feet and breadth 55.6 feet. She was larger than both the Maheno and Marama which were the New Zealand hospital ships of the First World War. Plans were made for some 390 patients to be accommodated in 100 swinging cots, 100 single fixed cots and 95 double (two-tier) fixed cots. (The number of cots ultimately provided was 365 – 22 fracture cots, 84 single cots and the rest two-tier cots.) The conversion involved a good deal of reconstruction, which was carried out by the Wellington Patent Slip Company at a cost of about £50,000. In addition much special equipment was installed. Plans were developed at a series of conferences between DGMS, other officers of Army Headquarters and of other Government departments, and the Union Steam Ship Company, while the Prime Minister, the Rt. Hon. P. Fraser, took a personal interest in the ship. The accommodation in the ship was completely stripped and redesigned in the most serviceable manner. A complete emergency system of lighting was installed, as well as electric lifts large enough to convey two stretchers from deck to deck, also with emergency power. A huge tank holding 700 tons of fresh water was built in to ensure adequate water supply between ports. On B Deck was the operating block. This wing contained everything necessary for the equivalent department in a modern hospital. Operating theatre and rooms for sterilising, massage, X-ray, diathermy, and incidental purposes occupied the space where once was the music room, and nearby was a fully-equipped dental surgery. Further aft on the same deck were recreation rooms for officers, for men and for nurses, while near the stern the plant was installed for a complete laundry, with modern drying rooms attached. C Deck was devoted mainly to wards. The theatre block consisted of two main units: a plaster room and the theatre proper. Both were exceptionally well appointed when compared with civilian general hospital standards and were equal to the many demands that the Maunganui’s varied roles made upon this important section of the surgical side. Not the least of these advantages was the proximity of the X-ray department, which greatly facilitated any procedures requiring the assistance of X-ray screening and radiography. In this connection especially, the orthopaedic work benefited greatly. The plaster room was fully equipped for the purpose – Hawley table, metal sinks and benches for the making of plaster slabs, X-ray viewing boxes, plaster bandage machine and ample cupboard and shelf space. The room was of generous proportions, enabling it to be used as an emergency theatre. The operating theatre proper was even larger. A modern operating table with complete accessories and a powerful theatre lamp on an overhead rail, which prevented the lamp swinging to the ship’s movement, were notable features of this important section. Adequately sized sterilisers provided hot and cold sterile water. There was even an artificial lung. Numerous extras such as ‘angle-poise’ lamps were in evidence and a large glass-fronted cupboard provided ample storage for instruments. Properly equipped washbasins were installed. The theatre and the plaster room were finished in a pleasing and restful shade of blue. Anaesthetic equipment again was more than ample. In addition to the usual bottles and masks for general inhalation anaesthesia, the theatre unit also had a fully equipped McKesson gas machine and an Oxford vaporiser. Three large side rooms opened off the main theatre and plaster room, while adjacent to both was the theatre store-room and a surgeons’ change-room equipped with shower and toilet, together with locker facilities. All essential lighting was duplicated on emergency circuits and the whole theatre block was ideally situated forward under the bridge on the promenade deck. The theatre was readily accessible to the main surgical wards owing to its central position and its proximity to the cot-lift. One feature in which the Maunganui differed from conventional British hospital ship layout was in the siting of the autoclave. This equipment is usually placed in the theatre block, but in the Maunganui it was sited some distance aft on the same deck. This was undoubtedly a tremendous advantage in the tropics and prevented overheating of the theatre. The various specialist departments were all grouped together: theatre, laboratory, X-ray, dispensary and physiotherapy. In addition, all the main cot wards with one exception opened off this central area. This centralisation greatly aided the working of the hospital side of the ship, thus saving time and space. The Maunganui could embark patients, both walking and cot, rapidly. The main dining-room was the main ward. Each of the eight wards had a different colour scheme, and where the lighting arrangements were changed, diffused lighting was installed over the beds. At the extreme stern of the ship and on the open deck was the isolation ward, complete in itself and entirely separate from the remainder. Not only was the deck space utilised economically in the provision of wards and incidental accommodation, but the holds which once carried cargo and luggage were also converted into quarters of various kinds. Where No. 4 hold used to be, the NCOs and orderlies had their accommodation, while another hold became a messroom for the men. While the power unit of the vessel itself was not changed, a complete emergency system of lighting was fitted and special conveyors were arranged for the transfer of food from the commissariat to various parts of the ship. Events in Greece hastened the completion of the conversion of the Maunganui to a hospital ship. The Prime Minister urged the supervising committee to day-and-night efforts to expedite her departure, and the DGMS was given a free hand to purchase all the medical and surgical equipment necessary without having to await the approval of the Purchasing Board. The estimated date for completion had been 15 May, but the ship was got ready by 21 April 1941. This was made possible only by expeditious work in the conversion of the ship and the fortunate procurement of equipment, some of which was not available in New Zealand. In the meantime the British hospital ship Somersetshire had transported invalids to New Zealand from the Middle East in March 1941. The Maunganui under the terms of her requisition, was manned and operated by the Union Steam Ship Company of New Zealand Ltd., the deck, engine and providore departments being staffed by the company’s officers and the ratings being drawn from the New Zealand maritime unions. The medical personnel were selected by the Director-General of Medical Services and the sisters were appointed from the New Zealand Army Nursing Service by the Matron-in-Chief. The staff of 104 medical officers, nursing sisters, and orderlies had been assembled at Trentham Military Camp. On 18 and 21 April they embarked and on 22 April 1 NZ HS Manganui left Wellington for Suez, with Colonel Murray as OC Troops, Miss Lewis as Matron and Captain Whitfield, Master. The Maunganui was not a unit of 2 NZEF and the staffing and equipping of the ship remained a New Zealand Army Medical Headquarters’ responsibility throughout the war. The immediate impression on the inspection of the ship was a very pleasing one. My personal expectations, knowing the difficulty of securing fittings in New Zealand, were far exceeded. It has been the unanimous opinion of all officers of the 2 NZEF, from the G.O.C. down, that New Zealand has every reason to be proud of its Hospital Ship. Evidence of this was obvious from the remarks of a Commander of a British hospital ship then lying at Suez, who stated that he had commanded three hospital ships in the present war, had visited every hospital ship that had arrived in the Middle East, and that he was definitely of the opinion that the Maunganui was the best fitted and finest hospital ship he had seen. The Maunganui was held at Suez until 10 June 1941 in order to take casualties from Greece and Crete. Invalids embarked for the voyage to New Zealand numbered 338. An allocation of forty beds was made to the AIF, in view of the fact that on each voyage of the Australian hospital ship some beds were reserved for New Zealanders. Thus on her first voyage the Maunganui took back a full load of patients, including many of the casualties from the Division’s first major actions. On the succeeding fourteen voyages she was always a full ship on her homeward run. On her outward trips, too, it was customary to pick up British invalids at Colombo and Bombay and take them to Egypt, where they were transferred to a British hospital ship. Apart from about six weeks in 1942 when she was laid up for overhaul, and a period in 1943 when, because of an accident to one of her propellers, she was taken from North Africa to the United Kingdom for repairs, the Maunganui was always on service. The Maunganui alone, however, was not sufficient to bring back to New Zealand all the invalids from the Middle East, especially after campaigns where casualties were heavy. Valuable assistance was rendered by the Australian hospital ship Wanganella, which carried many hundreds of New Zealanders, and by the Netherlands hospital ship Oranje. HS Maunganui spent much of 1945 with the British Pacific Fleet. On her fifteenth voyage, beginning on 17 March 1945, the ship was diverted at Melbourne from the Middle East to the Pacific, and she went on to Sydney, to Manus Island, to Leyte Island, where the ship functioned as a general hospital under Lieutenant-Colonel F. O. Bennett, with Miss G. L. Thwaites as Matron, from 13 April to 21 May before returning to Wellington. Leaving Wellington on 28 June, the ship again headed for the Pacific and was the medical centre for the British Pacific Fleet at Manus Island from 7 July to 18 August before moving on to Hong Kong and Formosa with the American Task Force 111 to pick up patients from among the prisoners of war released from the Japanese. Most of these patients were brought back to New Zealand on her return on 8 October. While at Leyte in the Philippine Islands on the fifteenth voyage the ship admitted 342 patients, most of them from other ships in the Fleet Train which was anchored around the Maunganui. The ship was used as a naval auxiliary hospital, half of the fleet being allotted to it and the other half to HS Oxfordshire. Patients were discharged to their own ship or, if this had sailed, to a ship which acted as a pool depot. Some serious cases were transferred to ships going to Sydney, and patients were also brought back to Sydney in the hospital ship when she returned. At Manus on the sixteenth voyage the ship admitted and discharged 242 patients before sailing to Hong Kong, where 111 patients were embarked. Then 108 patients were embarked at Kiirun, Formosa, and later another 156 at Manila on the voyage south again. A few were discharged at Hong Kong, Formosa and Manila, but 362 were brought back to New Zealand where, except for some Australians immediately transferred to a United States hospital ship to go to Sydney, they received hospital and convalescent treatment before being finally repatriated to their own countries, most of them to the United Kingdom by the Maunganui on 23 November. The patients embarked at Hong Kong included civilians as well as service patients, and many of those embarked at Formosa were British service personnel who had been taken prisoner at the fall of Singapore; those embarked at Manila included many Australians from a United States hospital and a prisoner-of-war reception depot there. They all speedily put on weight and improved in health on the hospital ship, whose staff was kept busily occupied in their treatment. The Maunganui took the ex-prisoners of war to the United Kingdom on her final voyage beginning on 23 November 1945 and ending on 20 March 1946, when she brought back to New Zealand the last of 2 NZEF invalids from Italy and Egypt. By this time the number of patients carried numbered 5677. The most important matter in the administration of a hospital ship was stated to be harmony between the Army and the Merchant Navy. This centred on the careful choice of the Master and the OC Troops. On the Maunganui successive OsC Troops worked in the utmost harmony with the Master, who showed the army medical staff every consideration. The person next in importance to OC Troops was deemed to be the Adjutant, who also needed to be specially chosen for the position. With a strong Matron, nursing sisters and a small number of voluntary aids were favoured. It was thought, however, that a preponderance of the nursing orderlies should be males, as they have numerous duties other than nursing to carry out – to supply guards, deal with fractious patients, make up stretcher and baggage parties, and assist in emergency precautions aboard ship, including closing the watertight doors, evacuating patients from wards and manning lifeboats. The male establishment of the Maunganui (72) was held to be too small for all these purposes, especially as work was frequently heavy and exacting, particularly in tropical waters. The Maunganui had more nursing sisters than most British hospital ships and was thought to be the better for it. Even then some officers thought that thirty rather than twenty sisters was desirable, and that there should be two dietitians, three physiotherapists and an occupational therapist. It was agreed that any future decisions on establishments for hospital ships would depend on the size of ship, length of voyage, type of patient and adaptability of staff. As regards the ship and fittings, it was felt that the Maunganui was very suitable for the purpose – she had adequate speed (averaging some 14 knots), stability in heavy seas, interior hospital arrangements well planned, and equipment of a high standard. One standing criticism was the lack of air conditioning, especially in a ship having to go through the tropics. Owing to a variation in requirements with every voyage it was recommended that a hospital ship should have six or more small rooms whose special purpose could be determined during each voyage, e.g., for plaster room, laboratory, special patients. It was felt that a reasonable amount of deck space for recreation was always necessary, as also was ample dining space for convalescent patients, and swinging cots and a reasonable number of wide fracture beds. Other points submitted for consideration arising from the Maunganui‘s experience were: a proper landing stage at least eight feet long at the foot of the gangway for stretcher cases; facilities for landing stretcher cases by winch; adequate laundry facilities; no wards between watertight doors or below the water line; companion-ways as wide as possible; and provision of the best type of life-jacket. In 1941 the Netherlands Government offered to the Governments of Australia and New Zealand the MV Oranje, a ship of 22,000 tons, for use as a hospital ship to convey Australian and New Zealand sick and wounded from the Middle East. This offer was gladly accepted by the two governments. The ship, which had been completed in Amsterdam only in 1939, was partially converted in Batavia to its new purpose and sailed to Sydney to be fully equipped and completed as a hospital ship. In April 1941 the New Zealand War Cabinet sent the DGMS (Army and Air) and the DQMG to inspect the Oranje and discuss the staffing and equipment with Australian officers. A conference of representatives of the Australian and New Zealand Military Forces, the Minister of the Army for Australia, and the Consul-General of the Netherlands Government was held at Sydney in April 1941. According to the offer, the Netherlands Government was to be responsible for the whole of the cost of conversion, including all material, surgical equipment and medical stores, and for the whole of the upkeep whilst the Oranje was engaged as a hospital ship. The ship’s staff comprised officers and crew of the Netherlands Mercantile Marine, and the medical establishment consisted of medical officers, nurses and other ranks of the Netherlands medical service, and a small supplementary staff of thirty, made up of Australian and New Zealand medical personnel. The Officer Commanding Troops (principal medical officer) and the officer in charge of the medical and surgical divisions were to be Dutch medical men specially selected by the Netherlands Government. It was agreed that the OC Troops would be in complete charge of all medical personnel and responsible for the general conduct, care and treatment of all sick and wounded soldiers from the time of their embarkation on the ship until their disembarkation. The Dutch matron was to be in charge of all female nursing and voluntary aid staff, and responsible to the OC Troops for their conduct and discipline. Two senior medical officers, one Australian and one a New Zealander, were appointed to the staff by the respective Directors-General of Medical Services to be in charge of the administration and discipline of the members of the staff from their own countries. One was a surgeon and the other a physician, and they were available for consultation and advice on all matters affecting Australian and New Zealand sick and wounded. The Oranje became the world’s largest and fastest hospital ship and was able to carry over 600 patients. She left Sydney for Suez on her first voyage as a hospital ship on 2 July 1941 and called at Batavia, where the Netherlands staff embarked. Notification had been made through Stockholm to the German Government that the Oranje had sailed, and the Germans had acknowledged receipt of the communication, but word had not been received by the Netherlands Government that the German Government agreed to the use of the Oranje as a hospital ship. Consequently there was considerable delay at Aden, but finally authority was granted for the Oranje to proceed to Suez, where New Zealand and Australian sick and wounded were embarked on 6 August. New Zealand invalids carried on this voyage totalled 193, and Wellington was reached on 1 September. At the outset it was realised that with three different nationalities constituting the staff of the hospital ship there were incipient difficulties of multiple control. Differences in temperament and language added to the problems of administration, as also did differences in procedure and disciplinary control. At the conclusion of the first voyage, however, the Director-General of Medical Services reported that in all respects the voyage had been a complete success. After the second voyage most of the Dutch medical staff was withdrawn for service in the East Indies as Japan had entered the war, but the Dutch OC Troops and matron remained in control of the medical staff, which comprised mainly Australians and New Zealanders in almost equal proportions and only a few Dutch. In 1942 the titles of the Australian and New Zealand OsC Troops were changed to liaison officers, which was the original intention. Both these officers then noticed a definite deterioration in their status and authority in the tripartite control. The standing orders of HS Oranje had made the liaison officers responsible for the discipline and control of their respective troops, but the OC Troops now showed a tendency to interfere. In 1943 the Australian Forces were returned from the Middle East to Australia and the Australian medical staff was then withdrawn from the ship, the New Zealand staff increased, and a British medical staff later embarked. The medical staff was then made up of 12 from the Netherlands, 44 from the United Kingdom and 76 from New Zealand. When the Australian medical staff was withdrawn for service in the Pacific theatre and was replaced by a British staff from the United Kingdom, there were added difficulties in having two disciplinary organisations in the one unit. The British wing was jealous of its individuality and maintained its company administration as a close corporation. Some of the British were regulars and were jealous of the New Zealanders who held key positions in so many departments of the hospital. It was realised, even during the New Zealand-Australian regime, that tripartite control was cumbrous and undesirable, leading to jealousies and indecision, and was uneconomical in personnel. When the situation deteriorated under the New Zealand-United Kingdom regime, it was realised that it could not continue indefinitely. New Zealand desired to remove its staff but, at the urgent request of the War Office, consented to allow it to remain, partly in the hope of the ship being made available when required for New Zealand use, and partly because of the shortage of British staff. Early in 1945 the United Kingdom withdrew the officer in charge of the United Kingdom troops and thereafter the British troops came under the disciplinary control of the New Zealand Army Liaison Officer. This removed one cause of disharmony and greatly improved the internal working of the unit. Early in 1944 the Oranje underwent alterations at Durban whereby her bed accommodation was considerably increased to enable her to take as many as 870 patients. During 1944 and most of 1945 the ship was considered as being completely within the British pool of hospital ships, and operated under the direction of the War Office. Her speed and her versatility of accommodation rendered her a most valuable unit in the pool. On one voyage there might be a preponderance of severe surgical cases, and yet at short notice she could on the next voyage receive a load containing a large proportion of pulmonary tuberculosis or psychiatric cases. During this period she was running mostly between the Mediterranean ports and the United Kingdom, with an occasional trip down the east coast of Africa to Mombasa and Durban. On the latter trips she carried sick and wounded both ways, repatriating South Africans, often coloured, and returning with British sick who had been evacuated to South Africa during the period the Mediterranean was closed. The Oranje’s speed was a great asset. At cruising speed Gibraltar could be reached in two days from Avonmouth, Naples in four, Port Said in six, and Durban in only sixteen. Very long voyages could be made without calling for fuel or water, as her fuel capacity was large, and all fresh water was made on board by condensation of sea water distilled by the heat of the exhaust gases. The very speed of the Oranje, useful though it was for the evacuation of sick, provided quite a problem for the staff on short voyages. For example, the Oranje was sometimes engaged on the Naples-Liverpool run for weeks on end. The voyage took four days, and in that time the orderly room had to work day and night to prepare a complete nominal roll under all the various headings required for disembarkation. Then on arrival disembarkation had to start immediately in groups whose composition was not known to the staff until after the Embarkation Medical Officer came up the gangway. Disembarkation complete, the ship usually turned round for Naples within twenty-four hours, leaving four days for the staff to clean the ship, get the laundry done and prepare for another large load. The New Zealand Medical Corps staff completed its duty in the Oranje on 26 November 1945. In all, the Oranje brought back from the Middle East 2542 New Zealand sick and wounded and carried over 15,000 sick and wounded altogether. The hospital ship rendered a sterling service. In 1945 assistance in the return of invalids to New Zealand was given by several British hospital ships, which had also during the course of the war carried New Zealand battle casualties on the lines of communication on the North African and Palestine coasts and across the Mediterranean from Italy. 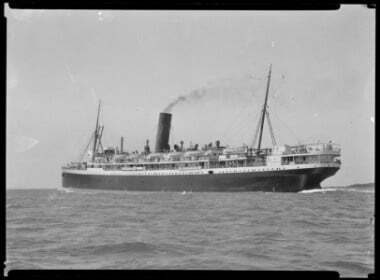 Altogether, with the Maunganui as the mainstay and with the help of the Oranje and Wanganella and other Allied hospital ships, a creditable record was maintained in the evacuation of sick and wounded from 2 NZEF throughout the war. Col D. N. W. Murray, CMG, DSO, m.i.d. ; born Auckland, 28 Aug 1876; medical practitioner; South African War, Corporal, RAMC, 1900; 1 NZEF 1914–19: CO Mounted Field Amb; CO 2 Field Amb; President, Travelling Medical Board, Anzac Corps, France; ADMS NZ Div, Germany; Commandant, Second Army Medical School, France; CO Military Hospital, Auckland, 1919; OC Troops HS Maunganui Apr 1941–Feb 1942; died Auckland, 4 Sep 1945. Matron Miss E. M. Lewis, RRC, m.i.d. ; (now Mrs Rudd); born England, 14 Feb 1882; Matron, Blenheim Hospital; served First World War Dec 1915–Jan 1920; Trentham Hosp 1920–21; Matron HS Maunganui Apr 1941–Feb 1942, Aug 1942–Nov 1944; Trentham Camp Hosp, 1944–45.